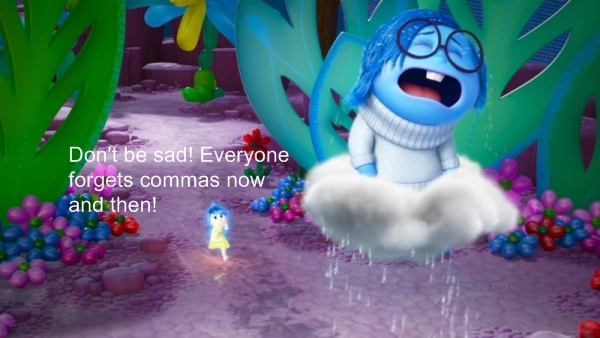 Let’s hope a missing comma is the least of our worries. War was coming, and it would arrive on a mahogany airship. Basilia glanced out the window for the fifth time, but the skies were still empty. She sighed and returned to her desk. Be optimistic. That was what her father said, but she found it hard to be upbeat when the day could end with the start of an interplanetary war. Her data tablet beeped and she glanced down at it. She hurried to the window and squinted out, shading her eyes with her hand. In the distance, the Royal Airship of Arrden approached. It was rich mahogany with dark green bands on the wings and a double wolf’s head was painted in black on the side. Basilia groaned. Her shoulders sagged and she leaned her forehead on the window. At the speed it was traveling, the prince would arrive in a matter of minutes. If she waited any longer, her mother would likely come up to check on her. Sighing, she turned aside and meandered to the door. She pressed a button on the wall and the doors slid open. Her feet dragged as she descended the winding staircase to the upper floor of the castle. Despite her effort to move as slow as possible without getting in trouble, the descent felt like a few seconds. The normally bustling halls were empty, save for guards posted along the doors. There were twice as many as usual. Did her parents expect an invasion? Today was supposed to be a peace negotiation. Finally, she emerged onto the flight deck. Her eyes widened and she gasped. It was completely empty. All of their airships had been moved to hangars along the side of the runway. The arrival of the prince’s ship drew her attention. The thrum of the ships engine’s died out. Uneasiness took hold of her, and she moved to stand beside her parents. Her father’s tanned face looked uncharacteristically taut and grim, while her mother was wearing a forced smile. It would fool anyone else, but after 17 years, she knew the look very well. A few moments later a ramp lowered from the underside of the ship, revealing three sets of feet. The owner of the middle set wore a pair of shiny leather boots with jeweled buckles. The two sets on either side were much simpler, and resembled the armor her personal guard usually wore. The three figures slowly descended the ramp. Behind them were their mounts, a bear, a wolf and a lizard. The first person she looked at was the prince. For the most part, he looked like the picture she had researched. Light skin, like most Arrdenians, short hair the color of tree bark, and dark green eyes. He wore a gold crown jeweled with emeralds and jade and bright silver armor inlaid with gold. A thick, furred cape hung from his shoulders and a silver sword with a gold and ruby hilt was strapped to his side. She frowned and wrinkled her nose. An arrow could easily cleave through silver armor, and a sword made from gold and silver would be useless. She shook her head. If war was to be avoided, she needed to be as respectful as possible. The two young men on either side of the prince had dark skin and a distinctive facial structure that marked them as natives of Eremita. They both had dark curly hair and brown eyes with thick, dark eyebrows. They looked nearly identical, save for the fact one was slightly shorter, and the taller one had a rounder face. Brothers, perhaps? Ilarion stop gazing about and held out his hand, palm facing to his left. Basilia stared awkwardly at it for a moment before recalling the traditional greeting in Arrden was different from her kingdom’s. She touched her palm to his and bowed her head slightly. The prince mirrored her actions then dropped his hand to his side. Her parents came to stand beside her and the greeting was repeated with her father. Ilarion did not wait for her father to withdraw his hand first. From what she recalled, it was considered respectful for the person of higher authority to withdraw their hand first. “It is an honor, prince Ilarion.” her father said. Basilia glanced at her mother and caught a brief glimpse of her gaze hardening and her smile fading. The look disappeared almost immediately. A wide grin lit up the face of the taller guard and he discreetly pumped his fist. “Yes, Princess Basilia.” The shorter one spoke quickly, stealing a glance at his companion. Basilia held back a grimace at the word merely. Creator, give me self-control. It’s going to be a long day. Ok, so this bounces between serious critique and just miscellaneous comments on things I noticed. Hope it’s helpful. -Ooh, fascinating first line. Airships! I approve! -Data tablet? Wait, is this sci-fi or steampunk? Or both? Can you clarify? I’d say to either change the “it” to “the airship” or “the prince” to “the prince’s airship”, just so you don’t have a semi-dangling “it”. I thought that the first line said war was coming on a mahogany airship? I’m a little confused. -Nice description of the parents’ expressions. -Bear, wolf, and lizard mounts. Ok then. I’m guessing that’s the standard in this world? Change to “She looked first at the prince” or something similar to avoid the “was”. -“Silver armor”- so, medieval-type armor? Not what I expected in a world that uses airships and data tablets, but ok.
-Why is our MC the first to greet the prince and his companions? Why not her parents? Why not someone else entirely? -On that note, maybe replace some of the “her”s and “she”s with your MC’s name, because I seriously couldn’t remember it at this point. Is his father there on the airship too? If so, why didn’t he come out? Or does the prince have some sort of fantasy/steampunk/sci-fi telephone/skype thing? -Dear Ilarion: I like your guards. I don’t like you. Overall, great start, and I really want to read more of this sometime! It sounds fascinating. Thank you so much for your suggestions, I’ll definitely keep them in mind as I re-edit. To clarify, It’s blend of medieval, in terms of government and way of life, so they still use weapons such as swords and wear armor, but they still have technology such as airships, since their world includes 5 planets and it is a necessity for travel. And yes, the most common form of land-based travel are animal mounts, basically like larger breeds of current day animals. I see how the whole war/peace thing might be confusing, so I’ll fix that- although for clarification purposes, the negotiation is sort of a last desperate attempt to avoid a war. Natasha, this is a nice intro into your story world. It did make me want to read more, and you showed the personality of the uppity prince quite well. The first paragraph twice indicated that war was coming, so I anticipated war. Yet, at the end of the excerpt, I saw no indication that war was imminent. The idea that war could start at any moment was lost, and so was the tension. As a reader, I felt that the promise was not kept. Also, I would have liked just a bit more scene setting. Is Basila in a ship of her own? In a house? When your POV character reacts to something, the reader needs to know what stimulated the reaction. For example, what caused her to shade her eyes? The sun? Lights on the ship? Next: In the distance, the Royal Airship of Arrden approached. Is this an atmospheric airship? That is, is it flying through the atmosphere of a planet? Next: It was rich mahogany with dark green bands on the wings and a double wolf’s head was painted in black on the side. Next: Her shoulders sagged and she leaned her forehead on the window. This sentence has two independent phrases, that is, the phrases can stand alone as two sentences. In such a case, you need a comma before the conjunction (and). Next: If she waited any longer, her mother would likely come up to check on her. I had no clue why her mother would come up to check on her. Why was this an important issue? Next: Sighing, she turned aside and meandered to the door. She pressed a button on the wall and the doors slid open. First, you have singular “door,” then plural “doors.” Also, you have two independent phrases again, so you need a comma after wall. Next: Her feet dragged as she descended the winding staircase to the upper floor of the castle. This is the first indication that she is in a castle. I wouldn’t have guessed this since she had a glass window. Also, how do you descend to an upper floor? Would you have to ascend to the upper floor? Next: Despite her effort to move as slow as possible without getting in trouble, the descent felt like a few seconds. Next: Did her parents expect an invasion? Today was supposed to be a peace negotiation. This confused me further. You started with relative certainty that war was about to begin. Now she is treating it as unlikely. Next: Finally, she emerged onto the flight deck. A flight deck in the upper floor of a castle? I am not picturing this.This threw me for a loop. Next: Her eyes widened and she gasped. It was completely empty. Comma needed after widened. Also, you show her reaction (gasping) before the reason for the reaction (the empty room). That order should be reversed. Next: It would fool anyone else, but after 17 years, she knew the look very well. The closest antecedent for “she” is the mother. You probably meant Basilia. Next: A thick, furred cape hung from his shoulders and a silver sword with a gold and ruby hilt was strapped to his side. Next: Putting on what she hoped was a friendly smile, she strode up to the prince, who was staring all around, his eyes wide and his jaw hanging open. Next: Ilarion stop gazing about and held out his hand, palm facing to his left. Next: Her parents came to stand beside her and the greeting was repeated with her father. Next: Ilarion did not wait for her father to withdraw his hand first. What did Ilarion do? You say only what he didn’t do. You probably don’t need “in greeting.” You make that obvious. Next: We have prepared are finest room for you and your guards. Next: A wide grin lit up the face of the taller guard and he discreetly pumped his fist. Next: The shorter one spoke quickly, stealing a glance at his companion. You used the stealing a glance phrase in the previous paragraph. I advise more variety. In order to prevent confusion, I would mention that she is in a castle right away, maybe by saying she looked out the castle window. I think it needs more to set the early scene. Thank you very much for your critique! I’ll make sure to fix those errors. I had a question, though. I want to describe the castle because it is unusual. However, it wouldn’t make sense for my MC to observe much about the castle since she has lived there her whole life. How would be able to describe it, without making it unrealistic? Come up with something that has changed. For example, can she see the landing area from the window? She noticed it had changed when she got there. If she can notice that earlier, you would have an opportunity to describe the layout then. Thank you, I’ll keep that in mind. One brief comment: When you are describing the two Eremita guards, you mention that they had “a distinctive facial structure that marked them as natives of Eremita”, but since the facial structure was not described I couldn’t see it… Was it a flat nose, a tattoo marking, high cheek bones, etc.? First, that was a good hook sentence. Very unexpected. From what I see here, you have a good handle on the world you’re building, but I would have liked a little more detail. Example: She ran her hand along the stones lining the staircase. Maybe there was a tapestry somewhere that could break up the monotony. Or: Their three mounts emerged behind them. One, an enormous black bear with piercing eyes. On its left a large lizard with mottled skin and a sickening orange tongue. On its right, a smokey eyed grey wolf. Magnificent creatures. Now, obviously, as I don’t know the features of the animals, this description may be way off base, but that is exactly the reason that I, at least, like the detail to paint a full picture.